Lemons- Use lemons that you squeezed for fresh lemon juice in your sink. Place the halves in your sink drain to prevent and eliminate odors. You can also use lemons to clean hard water stains on faucets, sinks, and shower doors! Pantyhose- Have a run in pantyhose or tights? Use them to hold onions. Yes onions. It keeps all of those bad boys together, neat, and prevents the onion skin from flaking off all over the place. Socks/old shirts- Don't throw out those stained shirts or torn socks. Cut them up and use them as rags for dusting and buffing furniture, cleaning your car, or wiping down counters. Old candle jars- Check out what you can do with these in one of our previous Posts. Used dryer sheets- Dryer sheets work amazing for cleaning and preventing dust build up on molding and baseboards. Dryer lint- Once you are done with a roll of toilet paper, keep the cardboard roll. Fill it with dryer lint and then wrap newspaper around it and twist the ends. You will then have the perfect fire started for your outdoor fire pit or camp fire. Old furniture- Don't throw it out! Re purpose it. Sand, Paint, and add new hardware to make something drab into something fab! Newspaper- Rather than throwing out newspaper, use it to clean your windows. I promise you once you use newspaper you will never use paper towels again. No streaks and your windows will shine like no other! 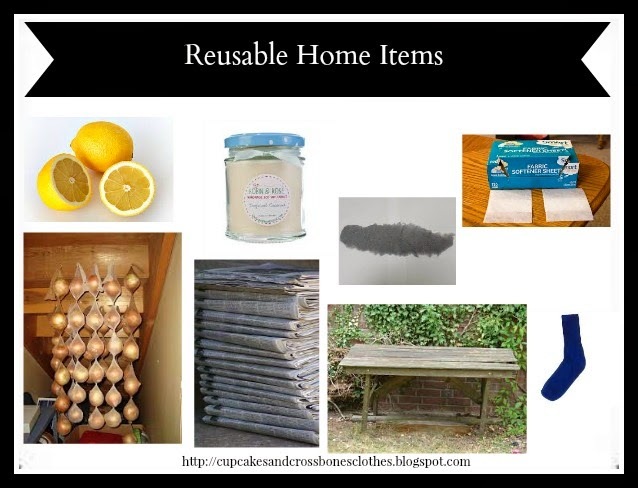 What other items do you reuse in your home? Love the lint idea as a firestarter. I use lemons in my disposal too keeping it smelling fresh. The firestater works great! Its so perfect for when we start fires camping. The dryer lint thing! My fiance was saving Baggies of Dryer lint and I'm like TOTALLY GROSS DUDE.. WTH? And he tells me about the outdoor fire thing, and It's just genius.. It still skeeves me out to see it though. MmmmMm A fire pit sounds so good right now, it's been raining like crazy ALL of this week. haha! I know right?! It really isn't the best thing to be collecting, but it works like a charm! What's better than a fire pit? I could go for one right now too ohhh and maybe some smores. Isn't it great to reuse or refurbish items (for free!). I love it!